Let's take another look at towers in the mediumwave band across the U.S. I did a previous series on RADIO-TIMETRAVELLER entitled Mediumwave Oddities in which one installment covered tower oddities. Oddities turned out to be fairly popular judging from the number of hits. I've always been interested in towers, and specifically mediumwave towers. Recently I've been in touch with Dan Goldfarb, owner of the Yahoo group MW Masts, and we have been exchanging information on mediumwave towers in the U.S. Dan is attempting to document every mediumwave tower in the world, and has made great progress to that end. Be sure to check out the MW Masts group. You will find interesting discussion and informative files available for download. As I drive around the country, it occurs to me that there is a lot of mediumwave metal up in the air. I wondered how much? A few code tweaks to my Radio Data MW program gave me the answer, supplying a comprehensive and interesting fact list of tower info. We'll get into the statistics toward the end of the article. But first let's talk about the different types of mediumwave masts in the U.S. A tower is a tower, right? Not necessarily so. There are four different types, and actually five counting the odd Franklin antenna which I'll describe shortly. Officially, the FCC defines tower types by numbers - 0, 1, 2-9 and A-Z. Sounds like a lot of varieties, but it's really not. In practice only types 0, 1, and 2 designators are used, in which type 2 can be one of two kinds. So there are basically four tower varieties plus the Franklin. By far the most common tower out there is the FCC type 0 (some 93%), a normal mast without any frills. It is simply a standard tower almost always insulated at its base. Stations strive to erect a tower at least one-quarter wavelength tall for the frequency at which they broadcast. At the low end of the mediumwave band this can be a tall tower - a quarter wave at 540 KHz is some 455 feet tall. At the high end of the band, in the western hemisphere at least, 1700 KHz, the quarter wave mast height would be only 144 feet tall. The aim in all cases is to push as much RF energy across the ground as possible in order to get the best signal out to the target audience. Gone are the days when stations prided themselves in a nearly cross-country audience (during darkness hours of course). It's all about local and regional target audience now, as that's where the ratings, and thus the money, comes from. So the object is to transmit as much signal near 0 degrees elevation (the ground) as possible, known as the "elevation angle" of the signal. The quarter wave vertical mast does a pretty good job, however by extending its length a little it gets even better. Excepting the Franklin type, a mast 5/8 wavelength tall does the best job, producing the strongest signal at the lowest angle. Only some 90 towers out of more than 7000 have heights in the range of 5/8 wavelength or taller. 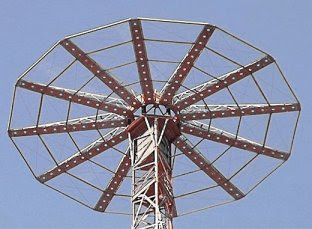 Few stations can afford this height, or may be prohibited from erecting such a tall tower due to various restrictions. Stations strive for at least a quarter wave for efficiency's sake. To the rescue came an old electrical innovation called top-loading, discovered by Thomas Edison and put into first practical use in 1905 and 1906 by Fessenden and Marconi in their transatlantic tests on 82 KHz. A simple flat-top method of top loading creates the necessary capacitive effect to electrically extend the length of the mast. The resultant antenna is sometimes known as an umbrella antenna, top loaded with a "capacitance hat" looking like an umbrella. Some 550 towers (a mere 7%) use the top-loaded scheme. The top-loaded tower is the FCC's type 1 tower. A fine example of a mediumwave top-load "hat" is that of Australia's 3WV, 594 KHz, in Western Victoria, pictured just below. So what is a type 2 tower, you ask? The answer is a sectionalized tower, which is a tower having insulated sections stacked atop one another. A scant 10 towers across the U.S. are sectionalized, an idea adapted for radio during World War I by Arthur O. Austin who already held the patent on sectionalized power transmission towers. The war ended, and Austin's sectionalized tower scheme was temporarily forgotten. Then station WHK, Cleveland, Ohio's pioneer broadcaster, erected a sectionalized tower. Though hampered by a power restriction of 1000 watts and a shorter wavelength, the station was suddenly being heard in faraway Honolulu, New Zealand, and all over the United States, achieving distances comparable to its super-power brothers. With a sectionalized tower, high angle radiation can be minimized to give better ground wave performance than is possible with a simple vertical radiator. Calculations for a 120 degree (one third wavelength) sectionalized tower versus a standard 120 degree tower show the unwanted high-angle radiation at 60 degrees above the horizon to be nearly 2.5 times more for the standard, non-sectionalized tower. So why aren't sectionalized towers more commonly used today? Probably cost, and the fact that super long distance reception is irrelevant in today's markets. It's an idea relegated to the past as far as mediumwave broadcasting goes. There are two varieties of sectionalized towers: non top-loaded and top-loaded, both falling into the type 2 designation, and both fed at the bottom of the tower. Top-loading on a sectionalized tower has the same effect as the standard tower - increasing the effective electrical height without building a taller tower. Now we have come to the Franklin antenna, actually a variation of the sectionalized tower. One of the drawbacks to the efficient 5/8 wavelength tower described above is an unfortunate lobe of power pushed skyward at an approximate angle of 60 degrees. During daylight hours this hardly matters as it is absorbed in the atmosphere. At nighttime this skywave reflection can cause the station to interfere with itself out at certain critical distances within the broadcast target area. The true Franklin antenna is composed of two half wave radiators mounted one above the other and insulated from each other. The tower base is insulated in the usual way. The difficulty is that the feed is in the middle of the tower instead of at the bottom. Feed line is run up inside the lower section, and a phasing network is used to feed both sections so that the currents in each are in phase, and the efficiency of two half-wave radiators is realized in terms of increased ground wave and decreased high angle signals. Thus, we have the Franklin antenna, a skyscraping one wavelength tall. Several stations claim to be using Franklin antennas. There is one true Franklin antenna array in the U.S., that of California's KFBK-1530 in Sacramento. It consists of two towers, each a full wavelength in height, each fed in the middle. The claim is that 50KW daytime KFBK-1530 has the highest published millivolt per meter level of any station in the FCC AM system - an average of 3545.89 mV/m at 1 kilometer distance. It is the highest figure found in the FCC's database, at least. Little known is that one other station, KSTP-1500, St. Paul, Minnesota, misses the perfect Franklin definition only by a hair, being just shy of a perfect full wavelength. Its single tower is comprised of two stacked 0.498 wavelength sections, making 0.996 wavelength height in all. It's computed (not FCC figure) millivolt per meter level is actually higher than KFBK's - 3618.76 mV/m. The difference is that the FCC publishes 1 kilometer field strength values for single towers based on a standard 1KW output, only 511.77 for KSTP. In actuality, 50KW KSTP-1500 is the champion. 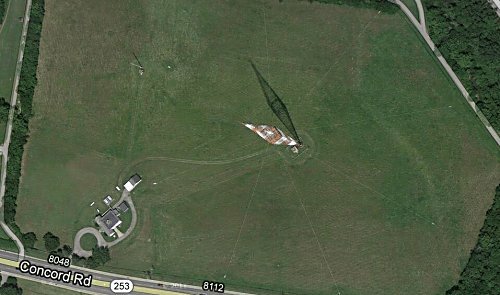 So, what does analyzing the FCC's tower data tell us? Here are the results. Data has been compiled from the 09-26-2012 FCC database. 4744 station facilities are represented. Since the ASRN (Antenna Structure Registration Record) is not recorded in many cases, tower heights in this list are necessarily based on the FCC's figure of radiating height of the tower, which is always indicated. In almost all cases it comes very close to actual tower height, the difference being the base insulator and top lighting. 4740 stations are on the air during daylight hours (99 listed as silent). 7176 towers are transmitting some 27,782,249 watts. How about that for an electric bill? 6666 are normal masted towers, that is, without top loading. 500 are top loaded. 10 are sectionalized. The tallest daytime tower belongs to WKY-930, Oklahoma City, OK at 951 feet tall (290 meters). Interestingly, the older WKY tower collapsed in a freak tornado back in June of 1998, and there is video of its collapse taken from an adjacent tower cam during the storm. There are 5 towers exceeding 750 ft. in height. They belong to WNAX-570, KMJ-580, WSM-650, WKY-930, WHO-1040. The shortest daytime tower belongs to KJNT-1490, Jackson, WY (listed as silent at the moment), a mere 50 feet tall (15 meters). The next shortest belongs to KBZY-1490, Salem, OR, at 52.8 feet tall. It is a top-loaded affair, the top-loading upping its effective height to a perfect quarter wavelength! In all, there are 12 towers shorter than 75 feet. They belong to KYPA-1230, KCFM-1250, WKCY-1300, KFJL-1400, WLUX-1450, WEEO-1480, WIRB-1490, KBZY-1490, KLZN-1490, KJNT-1490, KVOG-1530, WPDC-1600. Out of 4740 daytime stations, 3554 have omni-directional patterns, or a single tower. 1214 have shaped patterns using multiple towers. The total height of all towers broadcasting during daylight hours is 1,775,871 feet (541,286 meters), or 336 miles (541 kilometers) of metal antenna structure up in the air! Again, the highest daytime published millivolt per meter level goes to KFBK-1530 of Sacramento, CA with 3545.89 mV/m. KSTP-1500's actual calculated level is higher at 3618.76 mV/m. The lowest daytime published (and actual) millivolt per meter level goes to two-tower, 250 watt WCTA-810 of Alamo, TN with 140.82 mV/m. 4158 stations are on the air during nighttime hours (81 listed as silent). 7689 towers are transmitting some 10,956,214 watts. Quite a drop in power. 7,335 are normal masted towers, that is, without top loading. 525 are top loaded. 9 are sectionalized. The tallest tower "in use" day or night goes to nightime WRDT-560, Monroe, MI at 992 feet (302 meters). An interesting situation, as daytime and nighttime services transmit from different locations. WRDT-560 daytime service of 500 watts transmits from Monroe, MI (near Detroit) on 4 "short" towers of the same height (each 410 ft.). Nighttime service (a puny 14 watts) transmits from the huge 992 ft. Detroit Metro Media Center tower in suburban Oak Park. 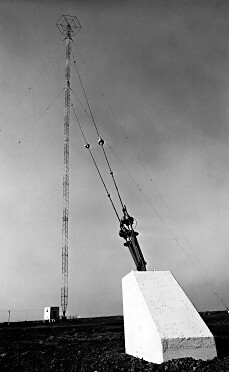 FCC records show WRDT uses the entire length of the tower to radiate its 14 watts. Even at the operating frequency of 560 KHz, the 992 ft. tower is still just 0.565 wavelength. The media tower is obviously used for multiple purposes. There are 6 towers exceeding 750 ft. in height. They belong to WRDT-560, WNAX-570, KMJ-580, WSM-650, WKY-930, WHO-1040. 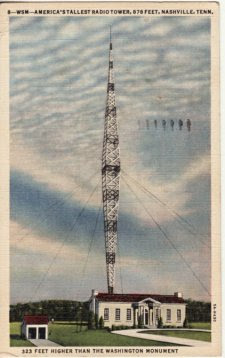 The shortest tower belongs to the nighttime operation of WSIV-1540, E. Syracuse, NY at 31.9 feet (10 meters) which appears to be operating out of a house in a residential neighborhood. It is not top-loaded either, transmitting a signal of 57 watts into a 0.050 wavelength radiator. It appears that nighttime WSIV-1540 takes the prize for the shortest wavelength antenna too. There are 13 towers shorter than 75 feet. They belong to KYPA-1230, KCFM-1250, WKCY-1300, KFJL-1400, WLUX-1450, WEEO-1480, WIRB-1490, KLZN-1490, KBZY-1490, KJNT-1490, KVOG-1530, WSIV-1540, WPDC-1600. Out of 4158 nighttime stations, 2530 have omni-directional patterns, or a single tower. 1655 have shaped patterns using multiple towers. The total height of all towers broadcasting during nighttime hours is 1,965,079 feet (598,956 meters), or 372 miles (599 kilometers) of metal antenna structure up in the air! Nighttime wins over daytime with an extra 36 miles of antenna tower. Several things are apparent from these statistics. Fewer stations (582 fewer) are on the air during nighttime hours, but they use 513 more towers than the daytime group. This is because of the need for signal directivity to avoid interference. The total power output of the nighttime group is only 39% of the daytime group, again for the same reason. Nighttime KFBK-1530 of Sacramento, CA this time has the absolute claim to the highest computed millivolt per meter level: 3126.79 mV/m. KSTP-1500 switches to a 3 tower array at night and loses its place. The lowest nighttime published (and actual) millivolt per meter level goes to two-tower, 1 watt WZRK-1550 of Lake Geneva, WI with a micro field strength of only 9.11 mV/m. WZRK takes the overall prize in this category. The next time you take a drive, look for mediumwave towers. They are an interesting subject! More from the west coast. I am headed across country soon. A nice shot of the WSM-650 tower as it appears today. If headed to the West Coast, be sure to check out the beautiful new top loaded tower of KFI-AM 640 near La Mirada,Ca. There was quite an ordeal from the collision that destroyed the original tower leading up to it's new replacement. It may be "beautiful" but it is shorter than the old tower and KFI's signal is noticeably weaker in fringe areas.